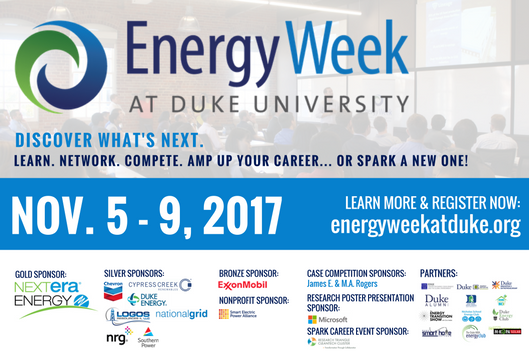 Registration (HERE: http://energyweekatduke.org) is open for the second annual Energy Week at Duke (Nov. 5 - Nov. 9, 2017). Hear from energy thought leaders (including the CEOs of Engie North America and ScottMadden) and meet up with energy professionals, students, and faculty from across the country at the full-day Duke University Energy Conference. But don't stop there. Energy Week at Duke includes 11 other events to help you discover what's next in energy technology, policy, and business. You can also network, compete (or just watch), and even make practical strides toward goals like lowering your home energy bill. Register now. Energy Week at Duke is organized by seven student clubs, with support from the Duke University Energy Initiative, the Center for Energy, Development and the Global Environment (EDGE) at the Fuqua School of Business, and a range of university and corporate partners.